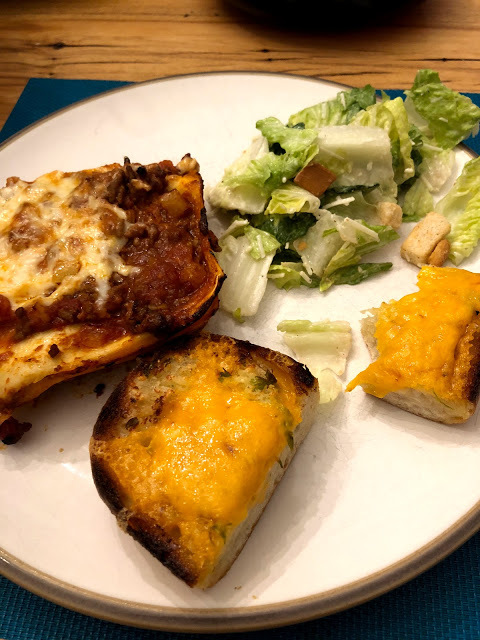 Lasagna is one of our favourite meals but I didn't really have a recipe, I just make it up as I go. But twice in the past few weeks I've had to tell my mom and Dave's mom to make it for our supper while I was at work. I couldn't just say "put together a lasagna" since my ingredients didn't necessarily match up to what they use. So I'm writing it down here so next time I can just send a link! 1) Preheat oven to 375 degrees F. Spray a 9x13 pan with cooking spray. 2) Heat olive oil in large pan. Sauté onion, garlic, and beef until beef is cooked. Stir in zucchini if using, and cook until softened. 3) Add tomatoes, tomato paste, oregano, and salt and pepper. Stir to combine. Simmer for at least 15 minutes, longer if you have the time. 4) In a medium bowl, combine ricotta, grated parmesan, and egg. Stir to combine. 5) Add a small spoonful of the meat sauce in the pan and spread it around. 6) Top with a layer of lasagna noodles, tear off any extra to make them fit. 7) Cover noodles with 1/3 of meat sauce. Dot with 1/2 of ricotta mixture and spread it around as best you can. 8) Repeat steps 6 and 7. 9) Top with one more layer of noodles (this is the third layer) and then the last 1/3 of the meat sauce. 10) Cover with grated cheese. Cover with tin foil (spray the bottom of the tin foil in case it touches the cheese as it melts). Bake for 35 minutes. 11) Remove foil and bake for another 15 minutes until cheese and sides are bubbling. Serve with this garlic bread.